Earth as flat? No....But why? Presumably you believe the earth is spherical and not a flat disk. Why do you believe this? Do you have any direct evidence? Have you ever circumnavigated the globe? Viewed the earth from multiple vantage points in space? Maybe, but more likely, you believe what you have been told, including what you have been told about what evidence there is for the earth’s sphericity (admittedly, it's both expensive and time-consuming to personally test the prediction that if the earth is spherical, and spins on its north-south axis, then the visible constellations of stars should change as one travels north or south). As a philosophy tutor, it's my job to help you question the why of what you believe. Now, hang on a second: let's suppose that the earth is not spherical. All the evidence you’ve been told there is since a child is either manufactured or misinterpreted. How likely do you think it is that you would discover, on your own, that you had been misled your whole life? Or, back in our actual, spherical world, suppose you had been raised on a commune of flat-earthers. Or that you had been born in ancient Mesopotamia, prior to the discovery of the earth’s true shape. 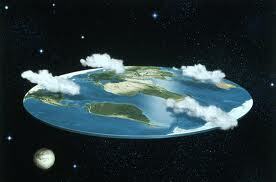 How likely do you think it is that you would ever change your inherited belief that the earth is flat? If the answer to these questions is: not very likely, then are you really and truly justified in your current belief that the earth is spherical? I raise this example not to suggest that anyone should actually change their belief about the shape of the earth. Although, I certainly wouldn’t discourage someone who decided that they needed to test some of the evidence out for themselves. Instead, the example is meant to illustrate the tension, raised in my last post, in the relationship between the ideal of autonomy in thought and action and the concrete reality of our lives as socialized beings dependent on the testimony and authority of others throughout our lives. Certainly it is infeasible for us to personally test all (most?) of our beliefs that we simply grew up with, like our belief about the earth’s shape. At the same time, we cannot refrain from submitting many such beliefs to personal critical scrutiny. If we didn’t, many of us would be stuck with beliefs we now find repulsive, e.g., beliefs about people different from us (in race, ethnicity, religion, gender, sexual orientation, socioeconomic status, etc.). But this leaves us in a bind: just how much critical scrutiny of our inherited beliefs is appropriate, or demanded, to do proper justice both to our nature as interdependent social beings and to ourselves as adherents to an ideal of autonomy in thought and action? If I am right about the above, we all have scores of beliefs that tend to be more sensitive to the social circumstances of our upbringing than to direct sensory evidence or our own exercise of critical reason. In honor of our example, call such beliefs shape-of-the-earth beliefs. Shape-of-the-earth beliefs tend to be conservative in the sense that they tend to be “imbibed” through tradition and somewhat resistant to change. The problem I am trying to articulate can be stated as the problem of what to do about the conservatism of shape-of-the-earth beliefs. Let me expand on it. The problem of the conservatism of shape-of-the-earth beliefs is not simply an abstract philosophical problem. It can arise for us, in different ways, throughout our lives. Consider how it can arise in higher education. People who go to particular Ph.D. programs often end up ascribing to the “school of thought” that tends to predominate either in the department or from the dissertation committee or advisor that they received their graduate education from. If they had gone to a different department, they would ascribe to a different school of thought. Or, if someone is raised with a certain vision of what a successful or respectable career looks like, she may end up ignoring opportunities she never would have had she been raised with even a slightly different vision of what an acceptable career is. One possible solution to our problem is to embrace the conservatism of our beliefs as much as possible and endorse a principle whereby one only attempts to change one’s beliefs when one is confronted with evidence that clearly calls for reexamination of them. Call such a principle, the No Unnecessary Change principle (NUC). NUC prescribes critical scrutiny of one’s beliefs only when one happens to come across “upsetting” evidence—evidence that hits one over the head, so to speak. For example, suppose Seth is raised with the belief that potatoes can only be cooked by baking them. Dutifully obedient to NUC, Seth never actively questions his belief that potatoes can only be cooked by baking them. The only kinds of things that would prompt reevaluation on Seth’s behalf, would be experiences like hearing from other people that they had cooked potatoes in different ways, actually seeing potatoes that he had been told had been cooked differently, directly witnessing a different cooking method, etc. When confronted with such evidence, NUC allows Seth to reconsider his beliefs about cooking potatoes. Should we endorse NUC? One problem with it is that it can divert us from contrary evidence that we might otherwise encounter. Suppose I am raised with the belief that no one from neighborhood Y is capable of being a good friend. If I subscribe to NUC, I may actively avoid anyone from Y and so actually miss any chance of confronting evidence that there are people in Y capable of being a good friend. On the other hand, if I actively reflect on the belief I was raised with, I may decide to find out for myself whether people from Y can be good friends. The possibility of gaining good friends one otherwise wouldn’t seems sufficient reason to me to reject NUC. If not NUC, though, what? Remember, it is implausible to suppose we can critically reflect on all our shape-of-the-earth beliefs in the same way that we just said we ought to examine the hypothetically inherited belief that neighborhood Y folks make terrible friends—we'd go completely insane. So how do we choose, if we also don’t accept the principle that we should wait until directly confronted with challenging evidence? This seems like a difficult problem indeed. Stay tuned for further thoughts from a PhD perspective…..